Police has smashed a four-man syndicate that specialises in receiving cars from notorious armed robbers and kidnappers. This came after the arrest in early July of the kidnappers of Deputy High Commissioner to Sierra Leone, Major-General Alfred Claude-Nelson, and the Executive Director of Dangote Group, Engineer Alhaji Mansur Ahmed. The Nation reports that, the kidnappers were arrested across Kaduna, Kano and Niger States were they operated in military uniform. They often stopped vehicles on the Abuja-Kaduna and Kaduna-Kano highways and seized passengers that appeared influential while valuable vehicles were taken and transported across the border to Niger Republic. From the confessions of the kidnappers and credible technical intelligence, IRT operatives moved to Kano State and apprehended the four-man syndicate of Abdulrahman Hassan aka Risi, aged 42 years, Abubakar Datti aka Baballiya, 45, Aminu Adamu Yakasai, 49, and Shuaibu Yahaya, 48. The syndicate claimed that receiving and selling stolen vehicles is a lucrative venture that offers the possibility of quick money and the chance of joining the class of rich Nigerians. 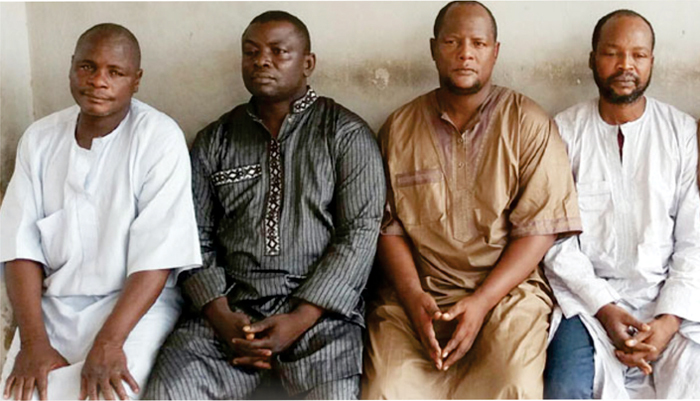 The kidnap suspects confessed to receiving more than 100 cars from various groups of armed robbers and kidnappers, including the 4Runner Jeep of the Deputy High Commissioner. ”I am a native of Gezawa area of Kano State. I was formerly selling ram at Dei-Dei Market at the Federal Capital Territory, Abuja, before one Usman Zamfara introduced me to receiving stolen properties in 2009. He told me that it was the only business they know and that they used to make good money. “In 2011, I was arrested by policemen from Delta State and sent to prison. I received a stolen Honda CRV from one Ebele in Warri Delta State, and after he was arrested, he led the police to me. I was arrested and dumped in prison. I got bailed one year later and went back to my business. “In 2015, I met one Suraju, who is late now, and he promised to always supply stolen cars to me. He gave me two cars: a Toyota Lexus 300, which I bought for N350, 000, and a Honda Accord Hennessey, which I bought for N150, 000. But before he died, Suraju also linked me to one Balarabe Mohammed, who sold a stolen Toyota Corolla 2002 model to me at the rate of N450, 000, a 2009 model Toyota 4Runner, which I bought at the rate of N1.2 million. I sold these vehicles to one Alfa who is based in Niger Republic. “I sold the Toyota Corolla at the rate of N700, 000 to Alfa and he also bought the Toyota 4Runner at the rate of N1.6 million. Alfa then paid N650, 000 for the Lexus and N330, 000 for the Honda Hennessey. I knew these vehicles were stolen, that was why I didn’t sell them in Nigeria and I endeavour to take them to Niger Republic where they would not be found. “Balarabe also brought a 2014 model Audi Squadron Saloon car, and I bought it at the rate of N700, 000 and sold it to one Garba Maradi in Maradi Town in Niger Republic. I sold it for N1 million. I also received two Honda Henessy, 1998 models, from one Babagana at the rate of N400, 000 each. I bought a Volkswagen Golf car from one Alhaji Tasiu of Plateau State at the rate of N350, 000 and I gave these vehicles to my boy, Abubakar Datti, to transport them to my new buyer in Niger Republic known as Mallam Maradi. I was paid N1.4 million for the three vehicles. ”I am an engine oil merchant and I also deal in spare parts. In 2012, I ventured into buying and selling of stolen cars. It was one Ali Yahaya who introduced me into the business. He brought four vehicles for me: a Honda Haller, which I sold to a doctor for N220, 000, a Braman Honda, which I sold for N270, 000, and a Honda Civic, which I sold for N180, 000. The fourth car, a Honda Aradie, was sold to a banker for N200, 000. “I got my commissions from the proceeds of the sales of the cars, but a few months later, Ali was arrested by policemen from Zone One Police Command Kano, and he led them in arresting me.